When I watched Makoto Shinkai's Your Name for the first time, I was mesmerized, again, by the breathtaking background art that's used in the movie. The whole film is a work of art, one that I can watch again easily just to admire the art -- I've watched the film three times by the way. The movie is fantastic so go watch it if you haven't. This 208-page paperback that I'm reviewing, 新海誠監督作品 君の名は - 美術画集, is the companion artbook for the film. It focuses only on the environment art so there are no character designs. The book is packed from front to back with gorgeous environment art. All the artworks are wonderfully reproduced on matte paper. Makoto Shinkai and his team really has a way with colours because every scene, every environment just looks so good. The lighting, mood and atmosphere is so magical. That guy can make a mundane typical scene look beautiful. In fact, one of the scenes which was based on real life had turned into a popular touristy place just because it was featured in the film. I've been following Makoto Shinkai's work for a long time and this guy has always been producing outstanding work. 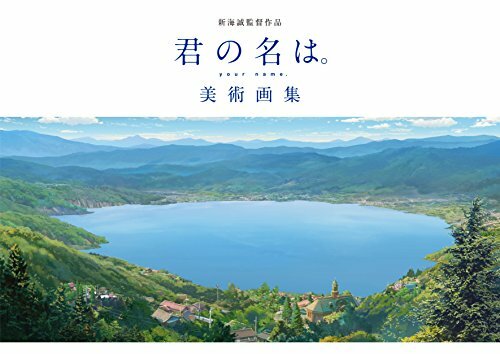 This is a book I would highly recommend to fans of the film, artbook collectors or those who love environment art or Japanese landscapes and scenes. If you like this book, be sure to check out his earlier artbook A Sky Longing for Memories: The Art of Makoto Shinkai (English edition) too. Watched the film recently, inspired by your book review. I had seen very positive reviews of it when it was released, but I had never got around to seeing it. Love it. Beautiful artwork and story. Has to be one of my favourite anime films.